The average US home spends 25% of its electricity on keeping the house lit with inefficient light bulbs. The conventional light bulbs (incandescent bulbs) that most of us remember as the only light bulb option will soon be obsolete. Each year, more and more homeowners are choosing to replace their inefficient incandescent bulbs with more efficient bulbs. Three of the most efficient energy saving light bulbs used in homes today are CFL (compact fluorescent), LED (light emitting diode) and halogen bulbs. These types of bulb types have become more popular as home owners realize the great energy saving benefits, which always translates into a money savings. 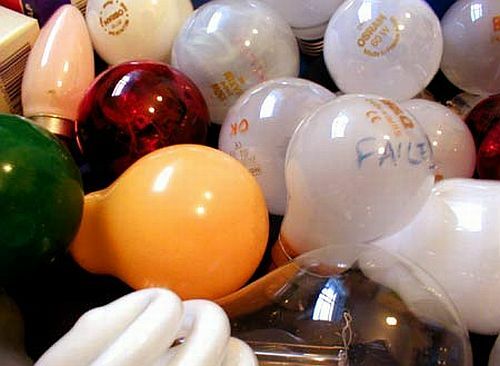 Currently, these newer http://www.networx.com/article/which-light-bulbs-are-the-most-energy-ef energy-efficient bulbs cost more than the conventional incandescent bulbs, however, they prove to last much longer. In fact, some halogen bulbs can last up to 10,000 hours. CFL bulbs are compact fluorescent bulbs that have a twisting shape appearance. They are more energy efficient than incandescent bulbs because they produce less heat and last longer. They use 1/3 the electricity and last up to 10 times as long as incandescent bulbs. For example, one, 18 watt CFL in place of one, 75 watt incandescent bulb, will save about 570 Kilowatts (kWh). The average cost of electricity per kWh is 8 cents per kWh. This would yield about a $45 savings for just one bulb (Eartheasy.com). Other advantages of using CFL bulbs include that they help reduce air and water pollution by producing less carbon dioxide (CO2). Replacing one incandescent bulb with a CFL can prevent as much as 450 lb. of carbon dioxide from entering the atmosphere. Another advantage is that CFL's provide a higher quality light compared to the bright white light of incandescent bulbs. Some homeowners fear using CFL bulbs because they contain small amounts of mercury. Electrical safety experts believe that the mercury in a CFL is not dangerous. The only danger associated with a CFL bulb is if it breaks and is not cleaned up and disposed of promptly and properly. Proper clean up consists of sweeping up the glass from the bulb (do not vacuum) and disposing it in regular trash. Image via WikipediaLED (light emitting diode) bulbs are used in lamps, small lighting fixtures and for Christmas lights. They are also used in small electronics, such as DVD players, as well as in tiny flashlights. Nowadays, LED bulbs are being used for more residential lighting applications, such as under-cabinet lighting, in recessed lighting fixtures and for landscape lighting applications. LED bulbs have an extremely long lifespan. They can last between 50,000 to 60,000 hours. This is more than four times longer than CFL bulbs. LED bulbs use only 2-10 watts of electricity (1/3 to 1/30 of incandescent or CFL bulbs). As with CFL bulbs, LED’s don’t produce heat. According to Eartheasy.com, "LEDs produce 3.4 BTU's/hour, compared to 85 for incandescent bulbs." In 2009, the first LED-based replacements for a traditional light bulb were made available to the public. These bulbs give off an amount of light equivalent to a 40-watt incandescent bulb. Most homeowners use 65 watt bulbs and higher. However, the extremely long lifespan of LED bulbs has made them into a popular choice. A halogen bulb is actually a type of incandescent light bulb. However, what makes them different is the way they work, "Halogen bulbs contain a gas compound that keeps the light source steady and bright while the tungsten wire is slowly burned up during the lifetime of the bulb" (ehow.com). A halogen bulb is typically 10 to 20 percent more efficient than an ordinary incandescent bulb of similar voltage, wattage, and life expectancy. There are several different types of halogen bulbs including two of the most common: reflector flood and PAR. Reflector flood halogen bulbs have a wide top and produce a whiter light than incandescent flood lights. PAR halogen light bulbs have a pointed shape and are typically used in recessed lighting fixtures and pendant lighting fixtures. Marcy Tate is a home improvement blogger at http://www.networx.comNetworx. She is also a featured writer at http://www.electriciansnetworks.comElectricians Networks. That's great to hear! I want to make the switch to these light bulbs. It's always great to save money when you can. I do seem to have a wiring issue in one of my rooms, I'll have to have an electrician check it out.